“There must be some way out of here” said the joker to the thief. “There’s too much confusion, I can’t get no relief. Businessmen, they drink my wine, plowmen dig my earth. “No reason to get excited”, the thief he kindly spoke. “There are many here among us who feel that life is but a joke. But you and I, we’ve been through that, and this is not our fate. So let us not talk falsely now, the hour is getting late”. After acknowledging the growing infestation of Budapest by pro-Russian, and white supremacist creatures engaged in undermining the values of Western democracies, the first obvious question that comes to mind is – what brought them here? What is the cause of this eastward migration of America’s and Europe’s often racist, always anti-democratic extremists? In interviews, that are publicly available, the creatures openly admit that they chose Budapest over Moscow, because it’s closer to the European battlefield, and the Hungarian government provides as good a cover for them as they could enjoy in Moscow. Some go on to say, that in Budapest, the women are women, the men are men. I would like to pause briefly here, to point to my own experience with what may happen to men or women in Hungary, who do not stay faithful to their gender’s traditional sexual appetites. While in Budapest, I marched in the 2008 Gay Pride parade along the city’s loveliest street – the Andrássy Boulevard. My exhibition of solidarity with the Hungarian LGBT community, nearly cost me my life. (I lived to tell about the incident here: “Van aki nem tud verset írni.” Népszava. July 10. 2008.) After I broke that story, and to my great surprise, the former democratic prime minister of Hungary, Ferenc Gyurcsány called me on my phone and invited me for a cup of tea to his office in Parliament. For those who would like additional evidence of my encounter with the creatures who swarmed around us that day, kindly call the former Minister of Equal Opportunities in Hungary, Katalin Lévai, whom I accompanied to the march, and who was next to me when the incident I wrote about happened. But let us return to the broader evidence. All of the creatures in the Budapest hills, who are going to be named in this narrative, have publicly admitted that Budapest has become the coziest place within the transatlantic community, for spreading global hatred against Jews, Muslims, women, the LGBT community, immigrants of color, non-Christians, environmentalists, and against all who embrace the values that serve as the foundations for all democratic societies around the globe. Who are these creatures anyways, where do they come from, and what exactly are they doing in Budapest? Without exception, their hero is Vladimir Putin. They all admire the „illiberal” state that Putin has erected in Russia, and which Putin’s Hungarian disciple has recreated inside the walls of the EU. They would like to introduce this “winsome” model to their motherland. They all operate some kind of social media platform targeted not at the local, Hungarian population, but at audiences in America, Europe and the Middle East. Matt Forney in Hungary. Photo: Matt Forney’s Facebook page. Richard Spencer, the neo-Nazi organizer of the Washington Brunch, also is a frequent visitor to Budapest, though he has not fared as well as Forney, because he drew too much publicity in the Western media to his hide-out in Budapest. 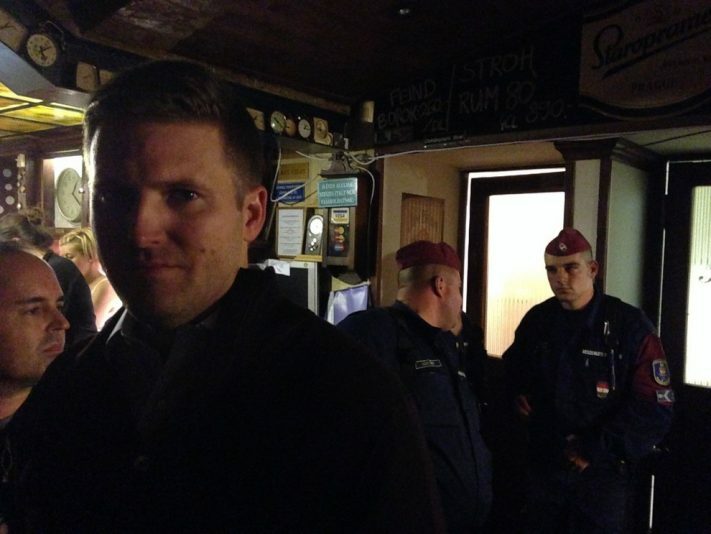 Richard B. Spencer at a pub in Budapest called the Clock House Café, in 2014, prior to his arrest by Hungarian police. Spencer was about to hold a gathering of Neo-Nazis before the police raid. Another of the pro-Russian, anti-Hillary bloggers with close ties to the American alt-right movement is Daniel Freiberg. He moved into the hills overlooking the Budapest Bridge from Sweden. (For an earlier report on him see MNG’s report. „Metapolitikai játszma.” Magyar Narancs, 2017. February 2.) In his interview with Miklós Nagy Gergely, Freiberg claims that hundreds of alt-right, pro-Russian extremists have moved to Budapest because Orbán has offered a safe haven for them. 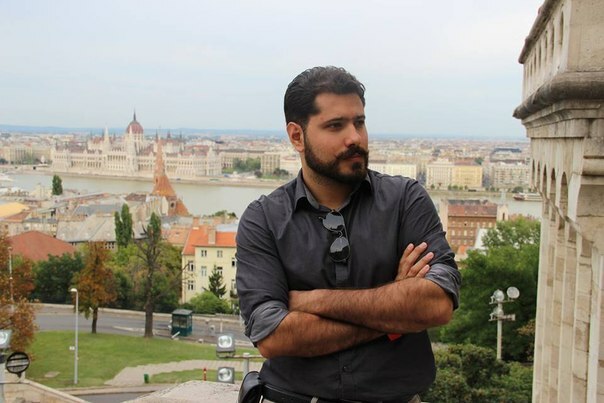 Freiberg moved to Budapest to operate altright.com, a site that has a massive following in the US. The site is edited by none other than the earlier mentioned American neo-Nazi, Richard Spencer. 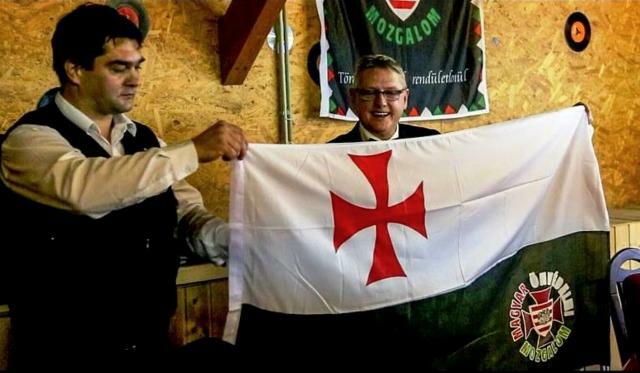 Jim Dowson (right) in Hungary, holding a flag that reads: Hungarian Self-Defence Movement (Magyar Önvédelmi Mozgalom). 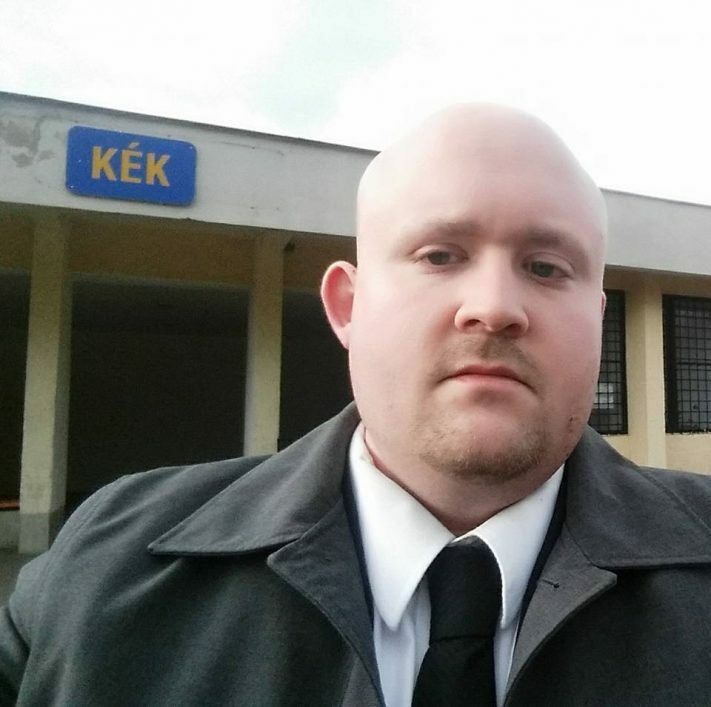 Apart from Dowson and Nigel Griffin, or the Dutch anti-immigrant radical Geert Wilders, who has his digs in a rural part of Hungary and commutes from the countryside for his meetings with Orbán, the deputy head of the Britain First Party, Jayda Fransen also developed a taste for “Gulyás Fascism” and moved to Hungary during the American Presidential campaign. She set up a bank-account and a business in the hills overlooking the Budapest Bridge. (Fransen is the high profile British extremist who has been found guilty of religiously-aggravated harassment in Britain. She was convicted for abusing a Muslim mother in front of her four young children, for daring to wear her hijab in public.) Fransen didn’t last long in Budapest. She was forced to close up shop, because she began to draw too much heat, and not enough followers. Ferenc Almássy posing in the Buda Castle, overlooking Budapest, with the Hungarian Parliament in the background. We’d be remiss not to mention one of the major cyber platforms of Donald Trump’s newfound love – the anti-immigrant neo-fascist Marine Le Pen – that is operated by the shadowy Suavelos group. Surprise, surprise? This platform also relocated to Budapest at the start of the American Presidential race. Here is some of the rhetoric of the pro-Le Pen Suavelos group, out of Budapest, that I stumbled across in my stroll through the Budapest hills: „Lespingal, Merkado and Conversano, nickel-plated feet are looking for apartments, secretaries, volunteers and money. And suicide bombers…Help someone but help someone white… Let’s get to the heart of the matter: white essentialists are looking for money and volunteers. To enrich half-fugitive masters in Hungary, where they will not be pursued by those whom they insult or threaten” For verifiable evidence of this item, please click here. Perhaps it is best to close the animal farm inventory with a German bird. (Stephen F. Cohen who never fails to raise his eyebrows when Vladimir Putin’s hand is caught in the kooky-jar, may appreciate the McCarthyite (sic) irony in my tone.) The pro-Putin anti-Clinton extremist I’d like to close with is Mario Rönsché, who also packed up his belongings in Germany, and set up shop in Budapest, to sling-shoot white supremacist, anti-Clinton messages into the bedrooms of America. Rönsché is one of the most prominent members of the German alt-right extremist movement. Like the Norwegian mass murderer, he also moved to Budapest to evade interference by German authorities back home. Rönsché has a Facebook following of close to two million people. According to our Hungarian sources he, like Dowson, has been frequently sighted in the Hungarian parliament, and enjoys the support and friendship of a number of Hungarian law-makers, and political activists on the Budapest Bridge. What’s with all these canadian-hungarian talking heads who all hate president Trump? It’s a happy day! Especially for those tormented by him and his cursed forfathers! Remarkable piece. Congratulations! It is unfortunate that the Hungarian public has little idea how isolated the country is… and how vulnerable their society is to fringe, almost bizarre (far right) ideologies, individuals. I am a big fun of free speech and the US First Amendment but in Hungary’s case countermeasures are needed to balance the influx of the European far right fringe. I don’t have the answers, but I suspect the money trail can help. Let’s not forget that David Duke KKK Grand Wizard has never been convicted for racism, he served jail term for tax evasion. and all this fascist birds came to Orban’s place where they feel at home. Now we know better what Orban meant by the seemingly idiotic statement that western refuges will come to Hungary – those who are oppressed (I guess, depressed) by the existence of democracy in their countries and would rather immerse themselves in the soothing fascism of Orban’s Hungary.